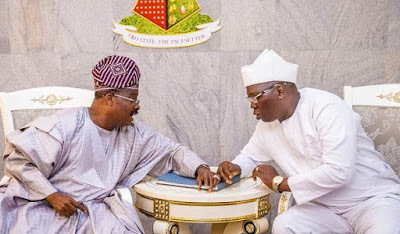 The Governor of Oyo State, Abiola Ajimobi, has endorsed the Aare Ona Kakanfo designate, Gani Adams, describing him as a pride to the Yoruba race and well deserving of the title. Mr. Ajimobi bared his mind when Mr. Adams led a large entourage to the Governor’s Office on a courtesy visit, in Ibadan, on Wednesday. The governor said that the 15th Aare Ona Kakanfo designate had contributed immensely towards the unity and security of the Yoruba race, as well as the projection of its culture through sponsorship of pan-Yoruba festivals. Mr. Ajimobi said, “You are very deserving of the position, because in critical time of need for local security, you were there for the Yorubaland. You have brought respect to local security and the Yoruba culture through your humane and gentle disposition to socio-cultural issues in Yorubaland. » Dbanj Gets N250M Etisalat Endorsement Deal?